This product is covered by our 30-day Money Back Guarantee and a 1-year warranty from PetSafe. The Deluxe Cat Flap Has oh-so-many options! Give your cat access to her litter box even when the door to the room it’s housed in is shut. 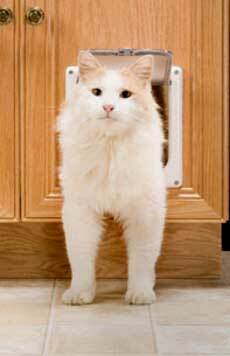 This durable, transparent cat flap fits any interior door that is 1” to 2” thick. And the four-way locking system gives you ultimate control of the kind of access you want your cat to have. 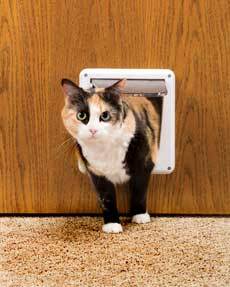 Let your cat pass through any interior door with the Cat Flap! Give your cat access to her litter box without giving her litter box access to your home! This durable cat flap fits any interior door that’s 1” to 2” thick. Your cat can come and go from the room where her litter box is housed – even when the door is closed. A sliding lock gives you the option to bar access whenever you choose.